Tree Fu Tom is to make his return to CBeebies in 2016. The pre-school kids’ network controller, Kay Benbow has commissioned a third season of the popular action adventure series. The third series will introduce a raft of new developments to the world of Tree Fu Tom, as he and his friends are faced with Red magic, a new extension of Tree Fu. By performing red Magic, Tom will be able to draw on attributes of real world animals. There will also be new locations including Deep Root caverns and the desert of Dead Branch. 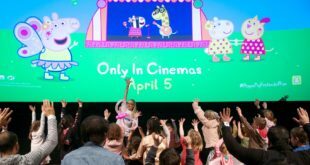 A co-production between CBeebies and FremantleMedia Kids and family Entertainment, Tree Fu Tom has been met with strong reaction acros the globe since its debut in 2012. “We are thrilled the BBC has continued its commitment to Tree Fu tom by commissioning a third series,” said Bob Higgins, EVP creative production FMKFE.